You may or may not know that Mass Effect 3 had a mobile companion app. It was called Datapad, and included a minigame where you could increase your galactic readiness, besides a codex and a news feed. For more on how all this will work, check out our Mass Effect: Andromeda multiplayer guide. And now, Mass Effect: Andromeda is getting its equivalent. The app is called Apex HQ, and anyone who’s been following news of the game’s multiplayer might guess from its name that’s all about that particular game mode. Mass Effect: Andromeda’s multiplayer matches appear as a list of missions. You can tackle them personally as multiplayer games, or you can send a strike team to try and get it done over a variable chunk of real time, much like War Table operations in Dragon Age: Inquisition. 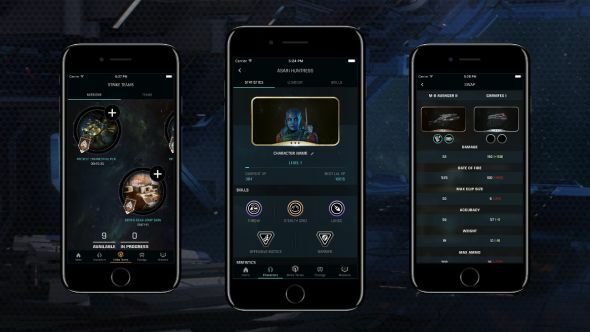 The Apex HQ app will let you dispatch those strike teams on-the-go, or change your loadout ahead of your next mission. You’ll also be able to track your multiplayer progression and check news and current missions – see the Apex HQ website for more. According to EA’s help page on the subject, the app is available worldwide from March 20, but if you’re in Canada, Ireland, Romania, or Singapore, you can get it from March 15. Make sure you log in with the same EA account that’s linked to your copy of Mass Effect: Andromeda.